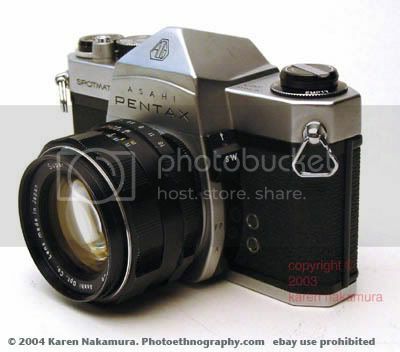 help on an asahi pentax spotmatic? recently i just acquired one from my aunt.. and i dont know how to use it..iive searched the net but its just too professional talk..
what makes it a spotmatic? what are the other knobs aside from the shutter speed knob? any basic any information would help thanks. here is a the one i own, this pic i got from the net. 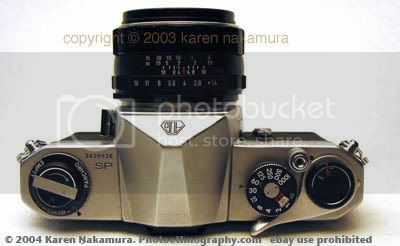 Re: help on an asahi pentax spotmatic? The spotmatic is a great little classic. I learned basic photography on an old Pentax Spotmatic! It gets its name because of its metering system, which is a spot meter. To meter you look thru the viewfinder and make sure the needle is right in the middle and voila, you got good exposure. Apart from that that there is nothing automatic about it! It's a fully manual film SLR. at last! i had some of my friends in lomography look at it and they told me that its battery is not available in the market anymore.. i cant use the meter. but ive got an AE-1 too.. hehe.. its battery still exists. acquired it the same time i got the spotmatic. You mentioned lomos ... i honestly do not see the appeal. If I wanted bad quality dream like photos i can do that digitally using my phone. Anyway, the spotmatic is fully manual, you can meter the old fashioned way - just look at the sun and lighting and guess the shutter speed and f/stop. Old films used to have a slip of paper with a chart of suggested exposure settings ... maybe they still do (I haven't bought a roll of film in 8 years!!). haha.. am not really into using toy cameras. hehe. and yes i need to learn how to guess what shutter speed to use, or i maybe id buy a light meter. thanks man. the A mode. It seems to work satisfactorily for her. jim is funny. i hate lomos too. hehe. well i just dont get the quality i want with lomos. id rather get a polaroid or a fuji instapix camera than a lomo. regarding the spotmatic, my ex gf had that cam and i think its really cool. it has this heavy casing that i like and a good easy interface to work with. no hotshoe? i think its cool. hehe.